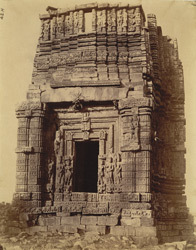 Photograph of the front of the large temple at Janjgir, taken by Joseph David Beglar in 1873-74, showing the doorway with sculptured architraves. J.D. Beglar described this temple in his 'Report of a tour in Bundelkhand and Malwa, 1871-72; and in the Central Provinces, 1873-74' (A.S.I. vol. VII, Calcutta, 1878), pp. 204-211, "The great unfinished temple stands on a large oblong terrace...The temple consists of a cell only; it is profusely sculptured outside with statues as at Khajuraha, but without any obscenity; the tower is only half, or rather less than half, finished, and is also profusely sculptured right up to the top as far as finished...The architrave over the entrance shows Vishnu as the central figure with Brahma and Siva at the sides as subordinate figures; the temple therefore was intended to be Vaishnavic; it faces east..."